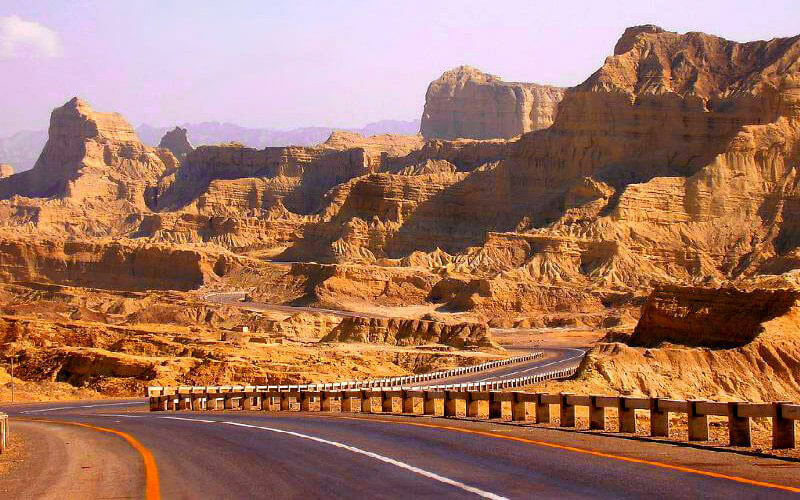 Sphinx of Balochistan: Creutair an Duine no an Nàdair? Chaidh fhuasgladh ann an cruth-tìre creagach iomallach air oirthir Makran ann an ceann a deas Balochistan, Pacastan, is e geam ailtireachd nach deach a lorg agus a thaisbeanadh airson linntean. 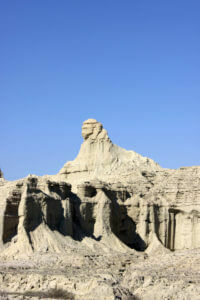 "Balochistan sphinx"Mar a chanar ris gu mòr, nochd e san t-sluagh nuair a dh'fhosgail prìomh rathad cladaich Makran ann an 2004, a 'ceangal Karachi ri baile-mòr Phort Gwadar air costa Makran. Tha slighe fad ceithir uair a thìde, 240 cilemeatair air feadh crannagan rathaidean beinne agus srathan gorm a 'toirt luchd-siubhail bho Karachi gu Pàirc Nàiseanta Hindol. 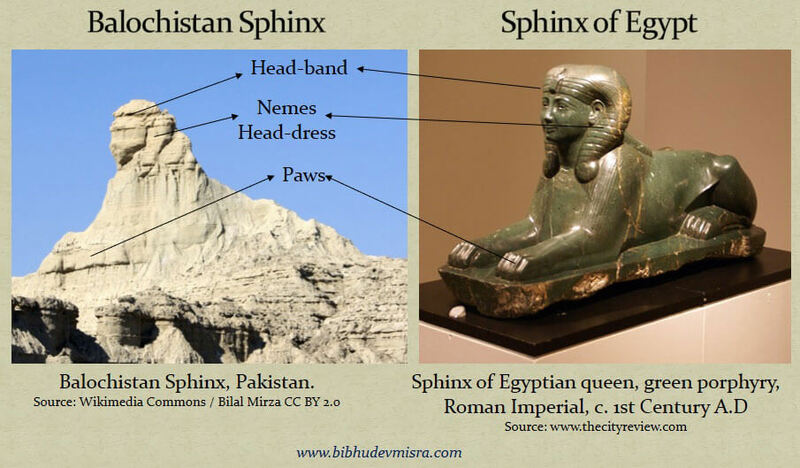 Seo far a bheil an Sphinx Balochist suidhichte. Balochistánská sphions trice le dearmad naidheachd mar nàdarra a chruthachadh, ged a bha an t-àite coltach gun robh rannsachadh arc-eòlais. Ma nì sinn sgrùdadh air feartan an structair seo agus an fhillte mhòr mun cuairt, tha e duilich gabhail ris a 'bheachd gu tric a chaidh a chumadh gu robh e air a chumadh le feachdan nàdarra. An àite sin, tha coltas mòr air an àite air an snaigheadh ​​bhon chreig. Sùil aithghearr air na eireachdail ìomhaigh seo a 'sealltainn gu bheil a' sphions aig a bheil deagh mhìneachadh smiogaid agus gu soilleir aithnichte aodann mar sùilean, sròn is beul, a tha suidhichte ann an dàimh cho foirfe. 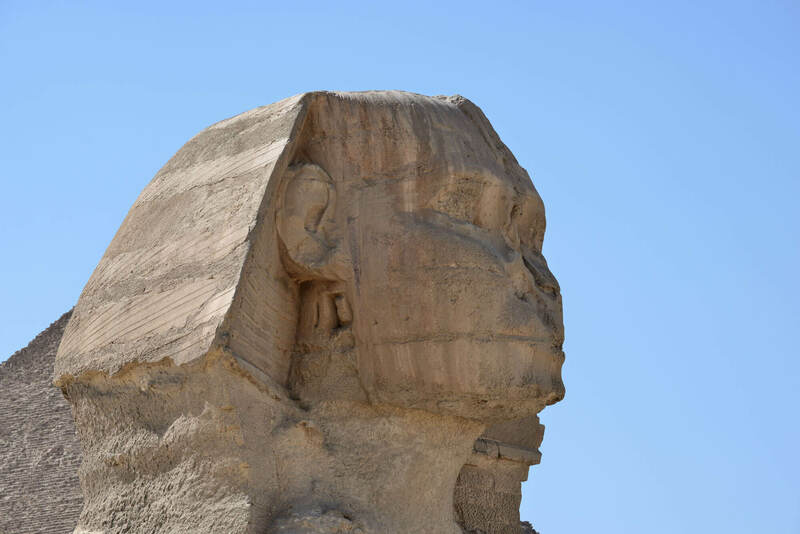 Tha e coltach gu bheil an sphinx air a sgeadachadh le aodach a tha glè mhath coltach ris an èideadh Nemeses a bh 'aig pharaoh na h-ÈipheitS an Iar- Tha Nemes a 'còmhdach a' chrùin agus pàirt den cheann. Tha dà bhrat mhòr a tha crochte air cùl na cluasan agus na guailnean. 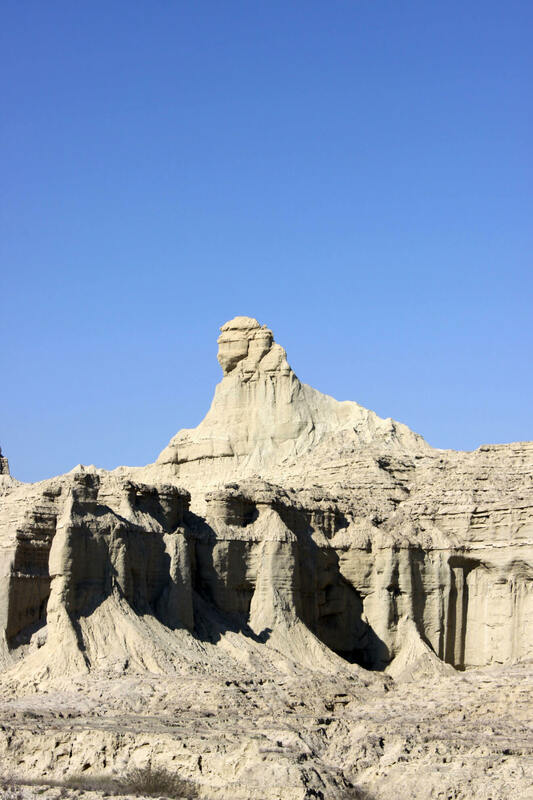 Faodar an sphinx Balochistan a lorg cuideachd le làmhan-làimhe cho math ri cuid de dhuilleagan. Tha lùb còmhnard air an Sphinx thairis air a 'chrann, a tha a' freagairt ri aghaidh an pharaoh a tha a 'cumail Nemes an àite. Is urrainn dhuinn furasta na co-thursan de chasan ìseal Sphinx fhaicinn, a tha a 'tighinn gu crìch ann am paisean fìor mhath. Tha e duilich a thuigsinn ciamar a dh 'fhaodadh nàdur ìomhaigh shnaighte a dhèanamh coltach ri beathach uirsgeulach ainmeil le fìor cho fìor iongantach. Tha faisg air Sphinx of Balochistan na structar cudromach eile. Bho astar tha e coltach ri teampall Hindu (coltach ann an ceann a deas nan Innseachan), le Mandapou (talla-inntrigidh) agus Vimana (tùr teampall). Tha coltas gu bheil mullach an Viman air chall. Tha an Sphinx na sheasamh air beulaibh an teampall agus tha e na dhìon mar àite naomh. Ann an seann ailtireachd naomh na sphinx, rinn e gnìomh dìon agus bha e mar as trice air a chur ann am paidhir air gach taobh de dhoras an teampall, uaighean agus làraichean naomha. Anns an t-seann Èipheit, b 'e corp leòmhann a bh' anns an sphinx, ach dh'fhaodadh a bhith na dhuine (Androsphix), ramus (Criosphinx) no falcon (Hierocosphinx). 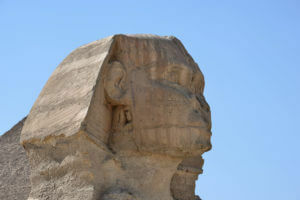 Mar eisimpleir, tha an Sphinx Mhòr ann an Giza ag obair mar dhìon an togalaich pioramaid. Anns a 'Ghrèig, b' e an sphinx ceann a 'bhoireannaich, sgiathan an iolaire, corp leòmhann agus, a rèir cuid, earball na nathair. Tha Colossal Statue de na Naxos Sphynx na sheasamh air a 'cholbh ionach aig Oracle Delphi, a tha na dhìonadair air an làrach. Ann an ealan nan Innseachan is deilbheadh ​​sphions tha e aithnichte mar Purusha-mriga ( "daonna ainmhidh" ann Sanskrit) agus a 'bhun-àite a bhith faisg air an teampull geataichean a bhith mar Fear a' Gheata. Ach, sphions a shnaidheadh ​​air feadh an teampull an togalach, a 'gabhail a-steach a' gheata (Gopuram), tallachan (mandapa) agus faisg air meadhan na h-chobhan (Garba-Griha). A) Sphinx cugallach le aghaidh daonna, ach le feartan sònraichte leòmhann, mar làmhan agus cluasan fada. Tha sphynxes cuideachd nam pàirt de dh'ailtireachd Bhanachas à taobh an ear-dheas Àisia. Ann an Myanmar canar iad Manusiha (Sanskrit manu-simha, a tha a 'ciallachadh leòmhann-duine). Tha iad air an tarraing ann an suidheachadh a bhith a 'crìonadh chait ann an oiseanan bothain Bùdhach. Tha crùn air an ceann aca, agus tha sgiathan cluaise sgeadaichte air na geòlaichean aca. 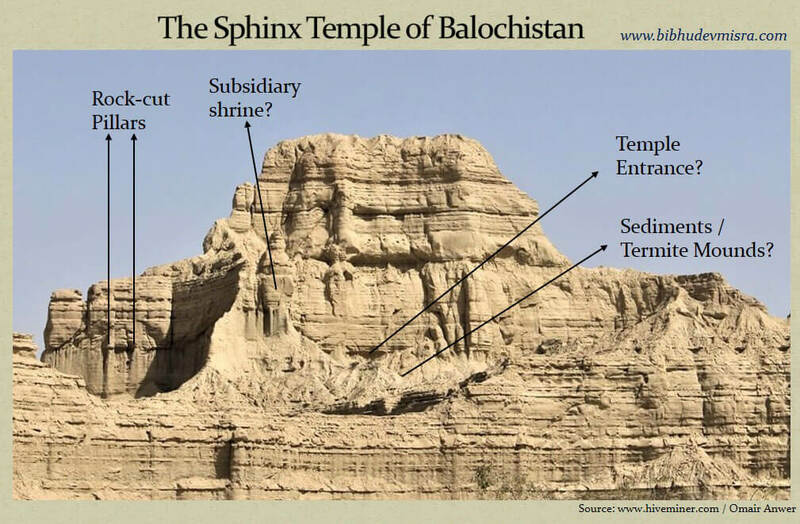 Mar sin anns an t-seann saoghal gu lèir b 'e an sphinium a bha a' dìon nan àitean naomhS an Iar- Is dòcha nach ann le cothrom, gu bheil Sphinx of Balochistan cuideachd a 'dìon structar an teampall leis a bheil e na nàbaidhean. Tha seo a 'moladh gun deach an structar seo a thogail a rèir prionnsabalan ailtireachd naomha. Tha sealladh nas mionaidiche air teampall Balochistan sphinx a 'nochdadh fianais shoilleir de na colbhan snaighte air a' bhalla chrìche. Tha an t-slighe a-steach don teampall ri fhaicinn air cùl cnap mòr de ghrùidean no termitas. Dh'fhaodadh structar le cumadh àrd air taobh clì an dorais a bhith na shràid taobh. Gu h-iomlan, chan urrainnear a bhith fo amharas gur e carragh àrsaidheachd a tha air a chruthachadh gu cruaidh, a th 'ann. Gu inntinneach, tha iad a 'nochdadh air aghaidh an teampall dà dheilbheadh ​​iongantach air gach taobh dìreach os cionn an doraisS an Iar- Tha gearraidhean air an crìonadh gu mòr, ga dhèanamh duilich an aithneachadh; ach tha coltas ann gur dòcha gu robh Kartikey (Skanda / Murugan) a 'cumail a sleagh; agus dh'fhaodadh am figear air an taobh chlì a bhith a 'coiseachd Ganesha. Air an t-slighe, is e an dà chuid Kartikey agus Ganesha mic Shiva, a tha a 'ciallachadh gum faodadh iomad an teampall a bhith air a chuir gu Shiva. Ged a tha aithrisean anns an stàit seo meadhanachach, tha làthaireachd ìomhaighean snaighte air an aghaidh a 'toirt barrachd cuideam don teòiridh gur e structar a chruthaich an duine a th' ann. 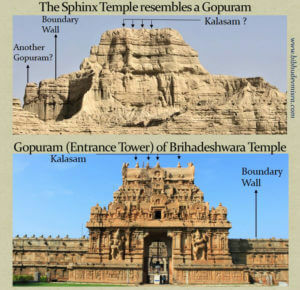 Tha structar an teampall Sphinx a 'moladh gum faodadh e bhith Gopuram, an t-slighe a-steach don teampallS an Iar- Coltach ris an teampall, tha an Gopuram sa chumantas rèidh. Tha grunn de chalasams sgeadachail (glainneachan cloiche no meatailt) air an eagrachadh gu h-àrd aig Gopurams. Bho sgrùdadh cùramach air mullach còmhnard an teampuill, faodaidh aon dhiubh a bhith eadar-dhealaichte air na "mullaichean" gu h-àrd, agus 's dòcha gu bheil grunn ghrùidean còmhdaichte le Kalasha no cnoc termites. Tha Gopuramy ceangailte ri balla crìochan an teampall, agus tha coltas gu bheil an teampall ri taobh a 'chrìch a-muigh. Tha Gopurams cuideachd a 'nochdadh figearan mòra snaighte den dvarapalas, ie na Door Rangers; agus mar a chunnaic sinn, tha e coltach gu bheil dà charactar cudthromach aig an Teampall Sphinx air an aghaidh, dìreach os cionn an t-slighe-steach a tha mar dhvarapalas. 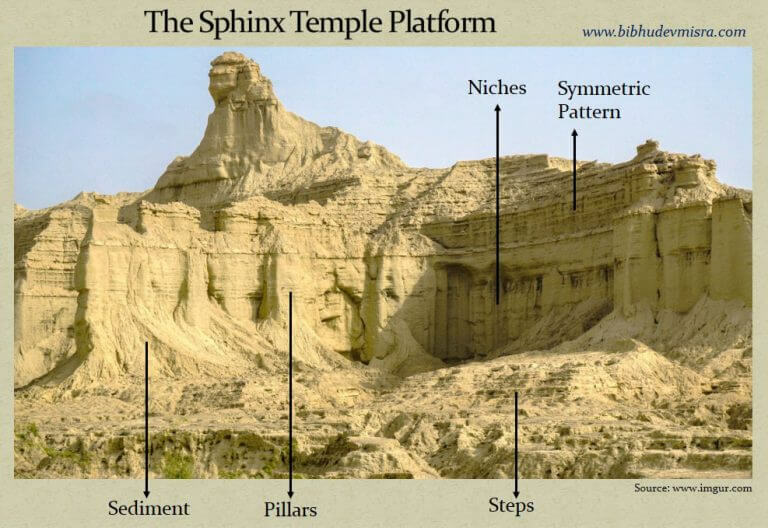 Dh'fhaodadh structar nas àirde air taobh clì an teampall Sphinx a bhith na gopuram eile. Tha e a 'leantainn sin, ann an àrdail na stiùiridhean a dh'fhaodadh a bhith ceithir gopuramy a stiùireadh gu meadhan lios, a chaidh a thogail prìomh comhan teampull iom-fhillte (nach e ri fhaicinn san dealbh). Tha an seòrsa seo de dh'ailtireachd teampall gu math cumanta ann an teamplan Innseanach a Deas. Tha an còmhnard a thogail air a bheil an sphions S e teampull, a rèir coltais a shnaigheadh ​​tro na puist, àiteachan agus co-chothromach phàtran a 'sìneadh thairis air an deic fad àrda. Faodaidh cuid de na cnuic a bhith na doras do na seòmraichean agus na tallachan fo teampall na Sphinx. Tha mòran dhaoine a 'creidsinn, nam measg Mainstream egtyptologů mar Mark Lehner, na seòmraichean agus earrannan dòcha cuideachd gum bi fo Great sphions de Giza. Tha e cuideachd inntinneach gu bheil an sphions bho Balochistan agus an teampull suidhichte air àrd-ùrlar, a thuilleadh air an sphions agus na pioramaidean anns an Èipheit a tha air a thogail air an Giza còmhnard a 'coimhead thar a' bhaile Cairo. Is e feart air leth eile den àite seo sreath de staidhrichean a 'dol gu àrd-ùrlar àrdS an Iar- Tha coltas gu bheil an staidhre ​​air a sgaoileadh gu cothromach agus cho àrd. Tha an t-àite gu lèir a 'cruthachadh sealladh de fhillte mhòr ailtireachd a chaidh a mhilleadh le eileamaidean agus air a chòmhdach le sreathan de ghrùid a tha a' falach mion-fhiosrachadh nas iom-fhillte mu snaidhidhean. 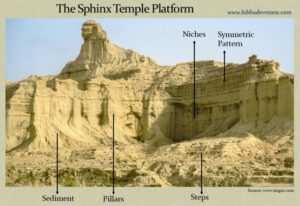 Faodar an àrd-ùrlar teampall sphinx a 'bhaile a dhèanamh de staidhrichean snaighte, colbhan, cnuic, agus pàtran co-chothromach. Dè a b 'urrainn dha uiread de thasgaidhean a chur aig an àm seo? Tha oirthir Makran Balochistan na sòn gnìomhach a bhios a 'cruthachadh sunamis uabhasach a tha a' sgrios bailtean gu lèir. Chaidh aithris gun robh an crith-thalmhainn bho 28. Dh'adhbhraich 1945 an t-Samhain leis a 'mhòr-chuid aige air oirthir Makran tsunami le tonnan a' ruighinn cuid de dh'àiteachan suas gu meatairean 13. 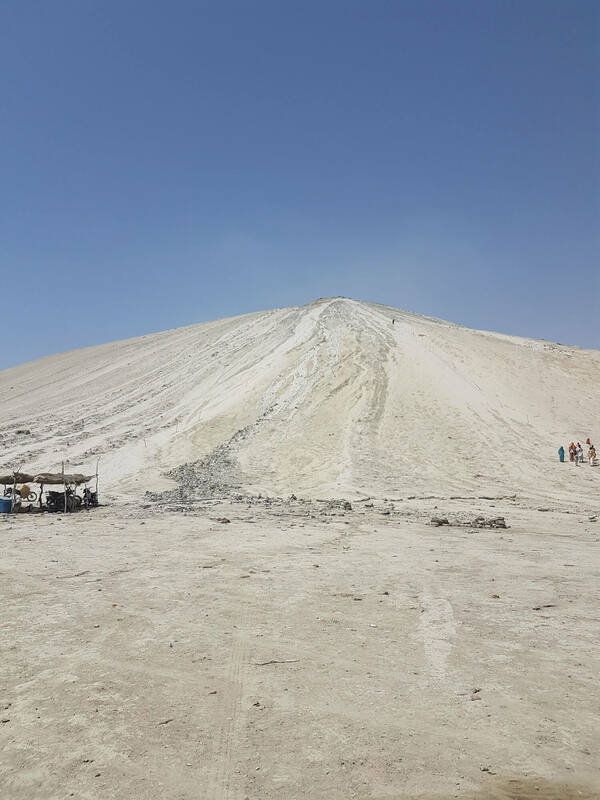 A thuilleadh air an sin, tha grunn bholcànoan boglaich air an sgaoileadh air cladach Makran, cuid dhiubh ann am Pàirc Nàiseanta Hingol, faisg air Hingolu delta. Crith-thalmhainn dian a 'toirt buaidh air bruthadh bholcàno, le tòrr eabar a' briseadh a-mach agus a 'buain na talmhainn timcheall. Uaireannan bidh na h-eileanan bholcànach boglach a 'nochdadh ri taobh oirthir Makran ann am Muir Arabianach, a tha sgapte thar aon bhliadhna le tonnan. Mar sin, faodaidh co-obrachadh tsunamis, bholcànoichean boglaich agus teirmean a bhith an urra ri bhith a 'cruthachadh ghrùidean air an làrach seo. 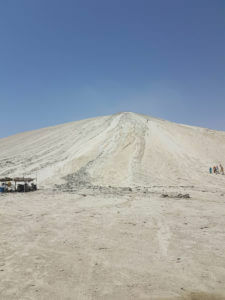 Ionnsaichte Indian teampull iom-fhillte air Makranském costa Cha bu chòir a bhith na iongnadh, bho na Makran riamh air a bhith a 'beachdachadh le Arab chroniclers mar "Borderline al-Hind." A-Biruni sgrìobh a "costa al-Hind' tòiseachadh grabhataidh, prìomh-bhaile Makran, agus an uair sin a 'leudachadh gu an ear-dheas ... "
Ged a tha làn chumhachd air atharrachadh bhon toiseach, tha e air a bhith a 'gleidheadh ​​an "eintiteas Innseanach" fad na h-ùine. Thairis air deicheadan nan creach Muslamach a bh 'ann roimhe, bha Makran fo rìghrean rìghrean Hindu aig an robh Alor prìomh-bhaile ann an Sindu. Tha am facal "Makran" Tha e air uairibh air smaoineachadh a Distortion an Persian Maki-Khora, a 'ciallachadh "iasg uaibhreach." Ach, tha e comasach cuideachd gu bheil an t-ainm a 'tighinn bhon "Draarastan" Makara. 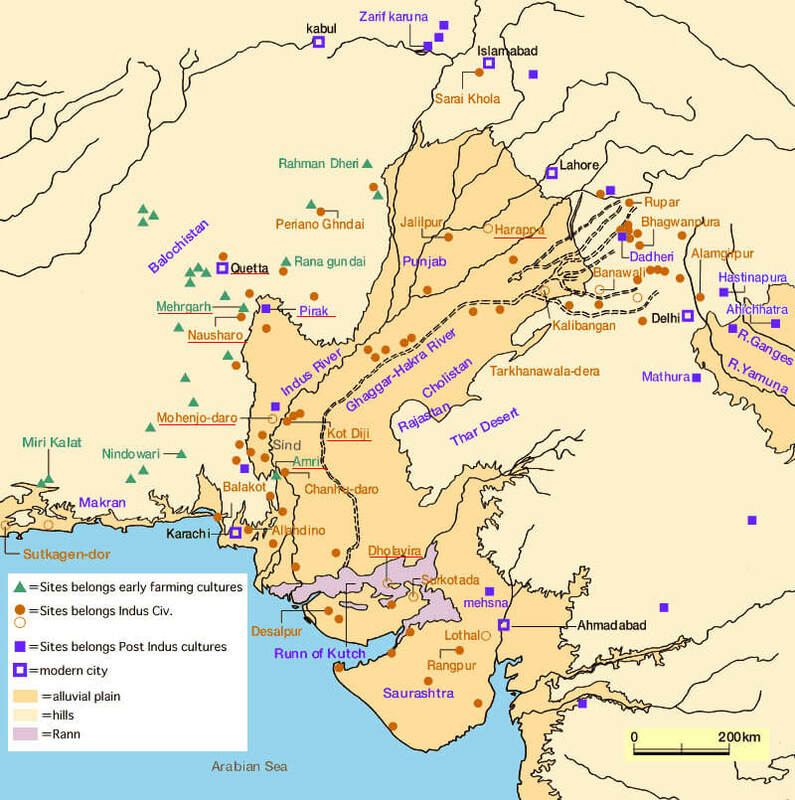 Cuin ann an 7. linn AD thadhail air a 'Sìnis taisteil Hiuen Tsang Makran, mhothaich e gun robh an làmh-sgrìobhainn, a chaidh a chleachdadh ann an Makran bha "gu math coltach ri sin ann an India," ach tha an cànan "a tha cliùiteach bho Innseanach." Same 'cheann-chinnidh arm Hiuen Tsang ainmeachadh mar' O-tien-P'o-Chi-lo ', stèidhichte air an rathad a' dol tro Makran. Cuideachd tha e a 'toirt iomradh sa mhòr-chuid mar Buddhist, sgapte, nach eil nas lugha na 80 Buddhist manachainnean le mu 5 000 manaich. Gu dearbh, 18 cilemeatair an iar-thuath de Las Bela ann Gandakaharu, faisg air an t-seann bhaile a tha Gondran uaimhean agus togalaichean a 'sealltainn gu bheil na h-uamhan gun teagamh bha Buddhist. Kij dòigh air feadh an gleann an iar (an uair sin fo riaghailt Persian) Hiuen Tsang chunnaic mu 100 6000 Buddhist manachainnean agus sagairt. Anns a 'phàirt seo den Makran cuideachd a chunnaic ceudan de teampaill agus Deva ann an Su-nu-li-Chi shi-fa-Lo - a tha' s dòcha Qasrqand - chunnaic Maheshvary teampull Deva, maisichte agus cumadh. Tha farsaingeachd mhòr de chruthan cultarach Innseanach ann am Makran ann an 7. linn, fiù 's aig àm nuair a thuit e fo chumhachd Persia. 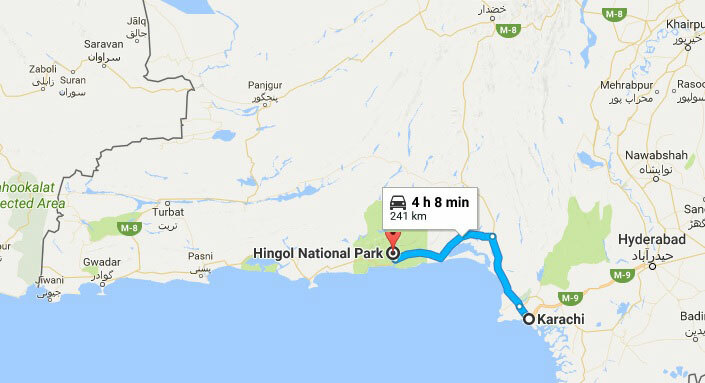 Airson coimeas a dhèanamh, an turas mu dheireadh a bha an t-àite mu dheireadh de Hindu taisteil ann Makran Hinglaj, 256 km an iar Karachi an-diugh, ann an Las Bela. A rèir liostaichean Hiuen Tsang, costa Makran, eadhon 7. linn, air a ghabhail a-steach le ceudan de manachainnean agus uaimhean Bòdaich, a bharrachd air ceudan de theamplan Hindu, a 'gabhail a-steach an teampall air an snaigheadh ​​le Morair Siva. 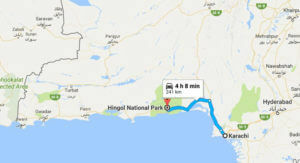 Dè thachair dha na h-uaimhean, na teamplan agus na manachainnean seo de chosta Makran? Carson nach deach an ath-ùrachadh agus a shealltainn don mhòr-shluagh? 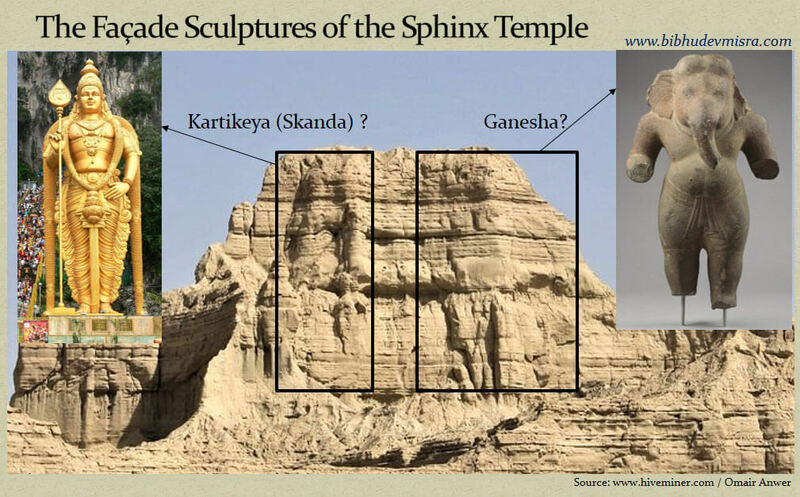 A bheil an aon adhbhar aca mar thoinnte de theamplan an sphinx? Is dòcha tha. Chaidh na carraighean àrsaidh sin, a bha air an còmhdach le grùid, a bhith air an dìochuimhneachadh gu tur no air am faicinn mar fhoirmean nàdarra. Gu dearbh, faisg balochistánské sphions, air mullach àrd-ùrlar, tha tobhta de coltach eile seann Hindu teampull, deiseil Mandap, sikhara (Vimana), puist agus cùlaistean. Dè an aois a tha na teamplan seo? 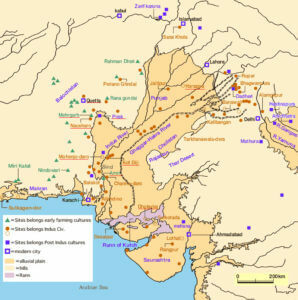 Indus Valley siobhaltachd a dhèanamh nas motha na Makranského air a 'chost agus an westernmost arc-eòlais sgìre ris an canar Sutkagen Dor, suidhichte faisg air a' chrìoch Iran. Nithean teampaill agus snaighidhean creige na sgìre, a 'gabhail a-steach sphions teampull iom-fhillte, a chaidh a thogail a chionn mìltean de bhliadhnaichean air ais nuair Innseanach ùine (timcheall 3000 RC) no na bu tràithe. Tha e comasach gun deach an làrach a thogail ann an diofar ìrean agus gu bheil cuid de structaran glè shean agus feadhainn eile air an togail o chionn ghoirid. Ge-tà, tha an dàta de charraighean snaighte sa chreig duilich air sgàth nach eil clàraidhean ann. Ma bhios an làraich a tha furasta a leughadh air a 'chloich a ghabhas a mhìneachadh (eile doirbh chionn' moladh an Indus sgriobt chan eil a thoirt suas a dìomhair). Chan eil ann ach an uairsin a chomharrachadh ceann-latha cuid de na carraighean. Ann an às-làthaireachd air soidhnichean,-saidheans a thèid a bhith an urra datable nithean / daonna fhàgail, stoidhlichean ailtireachd, geòlais bleith vrzorce eile agus ceòl. Is e aon de na rùintean leantainneach a thaobh sìobhaltachd Innseanach am pailteas de theamplaidean creag agus ìomhaighean creagach a tha air an togail bho 3. linn BC. Càite an do dh'atharraich na sgilean agus na dòighean togail air na h-àiteachan adhraidh naomha sin às aonais na h-ùine co-ionann de leasachadh? Faodaidh cruthan creige air costa Makran an leantainneachd riatanach eadar foirmean ailtireil agus dòighean-obrach bho linn nan Innseachan agus an t-sìobhaltachd Innseanach a dh 'fhalbh. 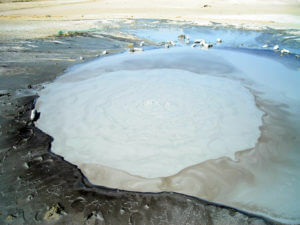 Dh'fhaodadh e a bhith ann am beanntan costa Makran, far an do chuir luchd-ciùird Innseanach na sgilean aca air adhart, agus an dèidh sin ghluais iad gu sìobhaltas Innseanach. Gun teagamh sam bith, tha virtual ulaidh de arc-iongantasan feitheamh ri bhith air a lorg air an oirthir Balochistan Makranském. Gu mì-fhortanach, tha na carraighean-cuimhne eireachdail aig a bheil tùsan a 'dol air ais do na seann neo-aithnichte, a' fuireach ann an iomallachd air sgàth an uamhasach ìre apathy faisg orra. Tha e coltach gu robh an oidhirp air aithneachadh agus ùrachadh orra glè bheag agus gu tric chan fhaicear luchd-naidheachd mar "cruinneachaidhean nàdarra". Tha an suidheachadh urrainn a bhith sabhailte a-mhàin ma tha na structaran a thèid a phàigheadh ​​aire agus eadar-nàiseanta sgiobaidhean de arc-eòlaichean (neo-eisimeileach agus an luchd-leantainn) bho air feadh an t-saoghail a 'tadhal air carraighean dìomhair sin gum faod iad rannsachadh a dhèanamh, ath-nuadhachadh agus a bhrosnachadh. Chan urrainnear ro-mheasadh a dhèanamh air brìgh nan seann charraighean sin air costa Makran. Dh'fhaodadh iad a bhith glè sheann agus dh'fhaodadh iad comharran cudromach a thoirt dhuinn a sheallas an àm dhìomhaireachd a bh 'aig a' chinne-daonna. A bheil thu ag iarraidh an artaigil? Thoir taic don eadar-theangairean san ath-dhreuchd agus cuiridh tu òrdugh seasmhach air cunntas follaiseach: 2900794933 / 2010. Pàighidhean bho thall thairis IBAN: CZ8920100000002900794933, SWITFT: FIOBCZPP. Cuir a-steach "DAR" agus tiotal an artaigil anns an teachdaireachd don neach a gheibh e no lìon an VS: 31670 agus SS: 100. Cuir air chomas gun cuir thu air dòigh seirbheis a leigeas leinn susbaint na làraich seo a chumail saor is an-asgaidh. A bheil an carragh cloiche ann an Nawarla Gabarnmung as sine san t-saoghal? Feumaidh tu a bhith logaichte a-steach a phostadh beachd. ET: A bheil sinn a 'tighinn ann an sìth? Ciamar a bhios eunthranach a 'conaltradh? Cuin a bhios an taisbeanadh mu dheireadh a 'tachairt? Carson a tha nàimhdean coltach coltach rinn? Ciamar a dh 'àiteas tu bunait gnè fireann?